Today is the last day to take advantage of Hilton’s official status match. Hilton is offering a generous and easy match to your status with any other hotel program. If you have top-tier status with any other program I would jump on as it only takes a few minutes and a couple screen shots. 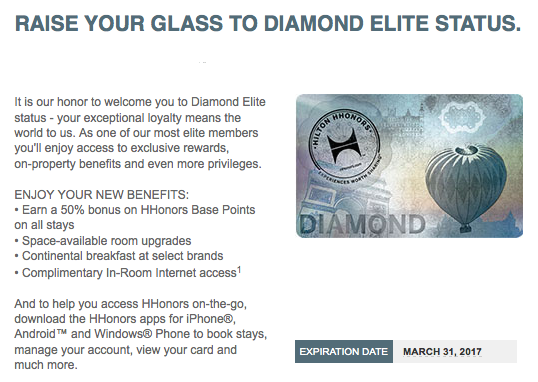 This means if you have Gold or Diamond (or equivalent) status with Starwood Preferred Guest, Hyatt Gold Passport, Marriott Rewards, IHG Rewards Club, Choice Privileges, or other hotel loyalty program you can get it for free with Hilton HHonors. As per the promotion page today Monday January 11, 2016 is the last day to submit for a status match. Once your status is matched you will keep it until March 31, 2017! As soon as Hilton released their status match promotion in response to Hyatt’s recent I applied via email (this was before the webpage was setup). I received the the automated response and waited about a week to receive the email confirming that I now have Diamond status with Hilton. I won’t use many of the perks and they certainly are not jaw-dropping, but having a slightly better chance at room upgrades, and not to mention lounge access and/or free breakfast at some of Hilton’s brands will be nice. I know many of you have already jumped on the bandwagon, but given that Hilton is basically handing out status via this straightforward promotion I’d considering taking advantage of it while it lasts!